Classes, community, and spaces come together to spark the artist’s flame in Bridgewater residents. Mary Ludwick taught home economics for years until her husband’s work took him on the road. Mary decided to travel with him, which left her with time to kill while he was on the job. So, she took up painting. “I needed something to do, and I come from a creative family,” says Mary. “My mother was always working with her hands.” Mary works mainly in pencils, pastels, charcoal, ink, and oil paints, but she always enjoys a new challenge. Now retired with her husband at Bridgewater Retirement Community, Mary can often be found taking an art class, learning new techniques and media. “Being a teacher means I like learning, and there’s always something new to learn,” she adds. Ann Flora also found a need to keep her mind active during retirement. Like Mary, Ann taught for decades. Ann chose watercolor painting and practiced her art for eighteen years, becoming accomplished enough to teach classes in Maryland, where she lived when she first retired. Ann recently dove into oil painting, courtesy of a class at Bridgewater. That community is something Jim Leitner and Dwight Miller acknowledge when discussing their common creative pursuit. The two took up woodworking for different reasons. Jim, pictured below, was an expert welder and metalworker until he needed a pacemaker. Because the electromagnetic fields created by welding interfere with pacemakers, he had to retire from both his career and his hobby. But the creative drive was strong in Jim. He started working with wood, first inventing a device to help people safely and more easily rise from a kneeling position. “My wife liked it so much, she confiscated it and turned it into a planter!” he jokes. Dwight, on the other hand, had long loved woodworking, especially turning wood on a lathe. That dovetailed with his career as an architect. He built furniture and other items in his home workshop, and he moved his equipment to his home here at Bridgewater. “I found it was something I couldn’t let go,” he quips. 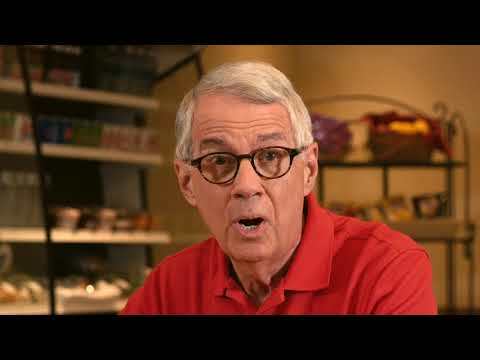 For Mary, Ann, Jim, and Dwight, the need to express themselves creatively is not only healthy, but it also creates connections to other people. 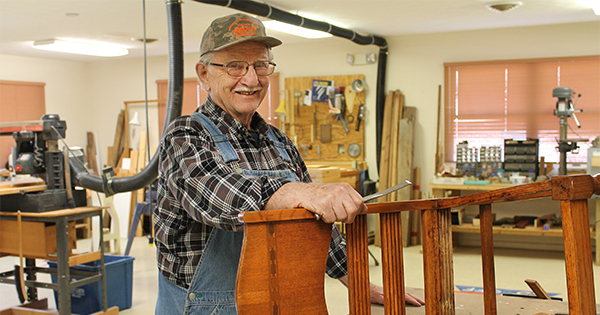 Jim restores furniture in The Barn so it can be sold and benefit others. 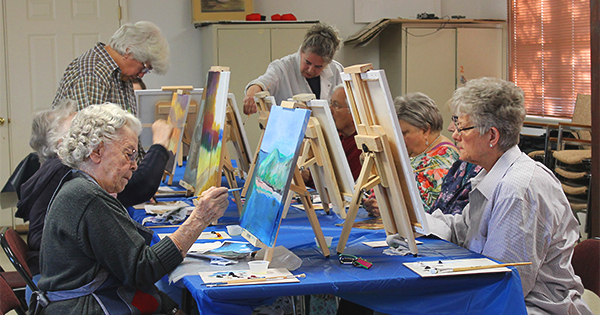 Mary and Ann both love the camaraderie of the art classes. “I enjoy being with others, helping one another, and learning something new,” Mary says with a smile. That community also extends to her quilting group – another creative outlet. Dwight sings with the Bridgewater Community Choir and the Shenandoah Valley Choral Society. “I’ve been singing since I was six years old in the church choir,” he remarks.